On February 11, 1912, an estimated 120,000 people in Paris participated in a ceremony that was at once moving and macabre: a public procession to Pere Lachaise Cemetery, where the remains of a soldier named Albert Aernoult would be incinerated after a series of angry speeches denouncing the circumstances of his death. This ceremony occurred at a pivotal point in the Aernoult-Rousset Affair, a three-year agitation over the practice of French military justice that was labeled a proletarian Dreyfus Affair. Aernoult had died in one of the French Army s Algerian penal camps in the summer of 1909, allegedly at the hands of his officers. His death came to the attention of the public through the intervention of a fellow prisoner, a career criminal named Emile Rousset, who provoked prosecution in a military court in order to launch his own "J accuse "against camp officers. Rousset s charges seemed to be bearing fruit until he himself was indicted for murder, whereupon the entire Affair took on a new intensity.Cerullo s lively, suspenseful account of this dramatic story, which has never been fully told, will become the standard. In the current era of special military courts, commissions, and prisons, the subject of military justice is an urgent one. 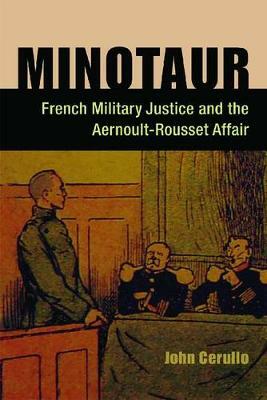 "Minotaur "will interest historians of modern France, military historians and students of military justice, and legal scholars, while also appealing to general readers of modern European history and military law. Although the Aernoult-Rousset affair has been examined by others, no one else has placed it fully in context, both the political controversy and the long tradition of military justice. Cerullo's style has verve and zest. He has organized the material skillfully and even creates a modicum of suspense. Benjamin F. Martin, Louisiana State University"